While Jackson Hole has a number of RV parks and private campgrounds, you will find many opportunities for camping in nearby National Parks, National Forests, and Wilderness Areas. 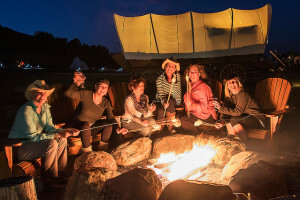 There is nothing in the Yellowstone area as unique as our luxury chuckwagons, featuring premium bedding, on-site family activities, meals, and gorgeous location. 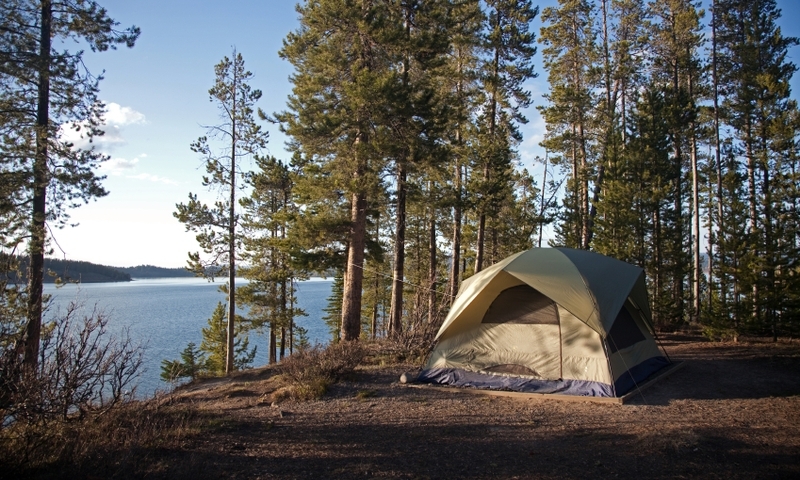 Whether by tent, RV or sleeping under the stars, Grand Teton Lodge Company offers camping with many amenities as you enjoy Teton views on the shores of Jackson Lake. 2 miles to Yellowstone Park's South Gate, find camper cabins, RV sites & tent camping in close proximity to explore Yellowstone & Grand Teton Parks & Jackson Hole. Book now! Season: Campgrounds are open May to the end of September. Length of Stay: There is a 14-day limit everywhere except for Jenny Lake, which has a 7-day maximum stay. Fees: Rates are $26/night for all public tent sites. 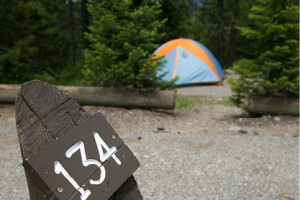 Headwaters Campground charges $37.50/night for tents. In Yellowstone National Park you can experience wildlife and fascinating geothermal features that make it famous as you camp in this beautiful wilderness area. Season: Some sites are open year round but most are open from late spring to fall. Length of Stay: There is a 14-day limit on length of stay except for Fishing Bridge Campground where you can stay as long as you like. 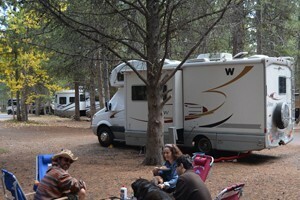 Fees: Sites usually have a fee ranging from around $15 to $29 and up to $50 with an RV. 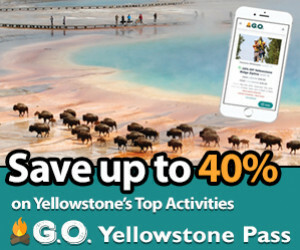 While a majority of the Yellowstone park campgrounds are available at first come first serve, there are a handful that you can reserve in advance. One of the largest forests in the U.S., the Bridger-Teton National Forest spans about 135 miles from the southern border of Yellowstone National Park and is easily accessed from Jackson Hole. Contact (307) 734-7400 with questions or visit their website. Season: Campgrounds typically open on May 20th and close by September 10th or 30th, weather permitting. Curtis Canyon is the closest campground to Jackson, Wyoming and offers great views of the valley and Grand Teton National Park. Drive east on Broadway until you reach the National Elk Refuge Road and turn left. Drive 8 miles along the east side of the Elk Refuge and up a winding dirt road to reach the campground. Granite Canyon is located southeast of Jackson, Wyoming. Drive south out of town for about 12 miles until Hoback Junction. Turn left onto 191/189 and drive 11 miles. Turn left onto the dirt Granite Road for 8 miles. Nearby activities include fishing, hiking, and soaking in Granite Hot Springs. Open form Memorial Day weekend to late September, there are 51 sites for tents or camping trailers. Vault toilets and water are also available. All sites are first come first serve. Atherton Creek Campground is located 7 miles east of the town of Kelly, which is 14 miles northeast of Jackson. This campground is situated along the shores of Slide Lake in the Gros Ventre Mountains. First come first serve. The Targhee National Forest runs along the west side of Grand Teton National Park in Idaho and from Yellowstone to Palisades Reservoir on the Wyoming side. Season: The campgrounds are open June to September. Length of Stay: For the campgrounds listed below, a maximum stay of 16 days is permitted. Fees: Fees run from $12-$24. You can reserve campsites in Targhee National Forest by going to http://www.recreation.gov/. Mike Harris Campground: A lovely campground in the forest with shady sites. Mike Harris is located 5 miles southeast of Victor, Idaho on Wyoming Route 22 on Trail Creek. Trail Creek Campground: Here you’ll find beautiful sites in the woods surrounded by pines, along the banks of Trail Creek. Trail Creek is located 7 miles southeast of Victor Idaho and adjacent to Wyoming Route 22. 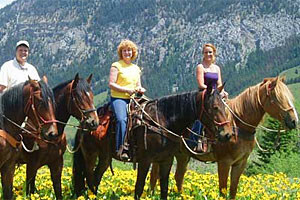 Teton Canyon Campground: At an elevation of 6,500 feet, this campground is situated among lovely aspen and pine trees. Drive 9 miles east from Driggs, Idaho, then turn east on Little Avenue and follow the road to the forest boundary. Turn right onto Forest Road 009 and go four miles to Teton Canyon Campground. The Gros Ventre Wilderness Area sits to the east of Jackson and spans the length of the Gros Ventre mountain range. The views of the Tetons from this side of the valley are unbeatable. Season: Camping is permitted any time, but the snow-free season is usually from July to September. In the higher elevations, you’ll find snow until the middle of July or late July. Length of Stay: There is a 16-day limit on length of stay. Fees: No fees; camping is primitive. You are asked to select a campsite that is hidden and at least 200 feet from the lakeshore. Camping information on our Grand Teton Lodging Guide. Campgrounds and RV parks near Park City, Utah.